Contact us today to discuss your commercial or domestic removals and storage requirements and arrange for a FREE no-obligation quotation! 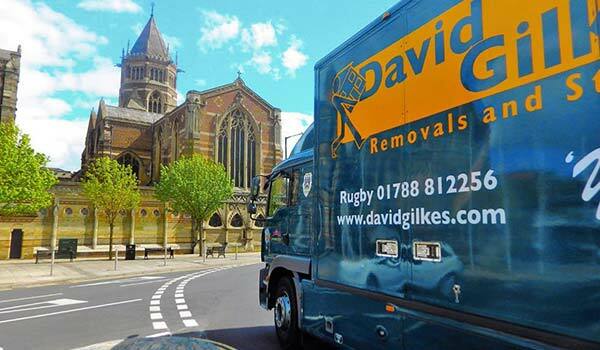 Welcome to David Gilkes and Sons Removals in Rugby, a family business offering professional office and house removals throughout Rugby, Leamington, Leicester and all of Warwickshire. With almost 35 years of experience providing removals services to homeowners and businesses across Rugby and the surrounding region, we are proud of a reputation spanning two generations for reliable, efficient, professional removals services tailored to each individual customer. Making our service as comprehensive as possible we can cater to almost any moving requirement including long distance removals. The principal business activities of David Gilkes & Sons Ltd, is removals and storage. We currently operate with over 15 staff, 7 vehicles and 12,000 square feet of warehouse & office space. David Gilkes & Sons Ltd is a family run business with a proven record of excellent service, delivered simultaneously to the domestic and commercial market. Established as a support service to the removals but also offered as an independent service available to private clients, businesses and students, we operate a containerised and archive storage facility with 24-hour security. Providing a complete service collecting your items, storing them and delivering them back to you when required, the service is ideal for freeing up space at home or in the office, as a store for students on summer breaks or as temporary storage if there is a lag between moving out and in dates. We now operate Simply Shredding Rugby for the local and surrounding areas. If you require documents shredding, then contact us for a fast and competitive service. You can deliver into our office which is open 6 days a week or we can collect if that suits you better. We cater for Office and Home shredding. Please click this link for more information. We push ourselves to work to the highest standards of professionalism and customer service and are widely accredited by the industry for our efforts. Officially approved by the Trading Standards and full members of the British Association of Removers and Freight Transport Association we meet high benchmarks and standards we are regularly re-assessed on for service, quality of removals and compliance with health and safety regulations. More than anything, we guarantee our dedicated team of removers will support you throughout the whole process, and make a stressful experience a lot easier! You can find full details of our moving services on the house removals and business removals pages of this website, as well as information on our containerised and archive storage and expert packing services. We also welcome enquiries at any time from across the Warwickshire area including Rugby, Leicester and Northampton; experienced members of the team are always on hand to answer questions. Contact us at David Gilkes Removals in Rugby today to learn more or arrange a quotation. We adhere to The Furniture Ombudsman, an independent, not-for-profit organisation specialising in Alternative Dispute Resolution (ADR) services for consumers and retailers.